The Dividist Papers: Divided government, statistics, and war. Divided government, statistics, and war. Our new test of the “Divided Government” hypothesis differs from my prior test in four ways: The data on real current federal expenditures is based on the major new revisions of the national income accounts, The test variable is now the per cent change in real current federal expenditures per capita, The years 1949-1952 have been added to the sample, and We use a formal difference of means test to estimate the significance of the differences in the mean rate of growth in real per capita federal spending in administrations during which the same party controls both houses of Congress from the mean rate of growth in administrations during which at least one house of Congress is controlled by the other party... "
"... the average rate of increase in administrations during which the same party also controls both houses of Congress is nearly five times that in administrations during which at least one house of Congress is controlled by the other party." This suggests that the optimal result in 2006 (considered exclusively from the point of view of restraining federal spending growth), is if the Democrats win a majority in just one legislative branch of Congress, the second best scenario is if they win a majority in both the Senate and the House, and the worst case would be if the Republicans were re-elected to a majority in both the House and Senate. These three scenarios also have implications for the divided government voting strategy in '08. The second scenario mandates a divided goverment vote for a Republican President in '08, the third scenario mandates a divided government vote for a Democratic President in '08, while the "optimal" first scenario suggests there would be no "divided government" presidential vote in '08, but only a vote to maintain a divided congress (essentially a vote for congressional incumbency). Niskanen also speculates about the reason that divided government works to restrain spending, and that speculation provides considerable food for thought. "One reason for this condition is that the prospect for a major war has been substantially higher under a unified government. American participation in every war in which the ground combat lasted more than a few days – from the War of 1812 to the current war in Iraq – was initiated by a unified government. 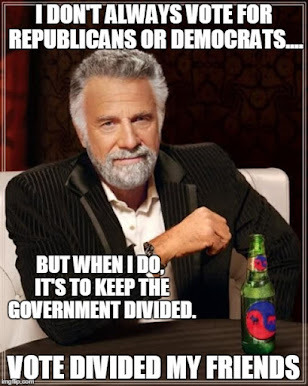 One general reason is that each party in a divided government has the opportunity to block the most divisive measures proposed by the other party... We find it hard to dismiss the implications of a nearly 200 year old pattern in which the American participation in every war involving more than a few days of ground combat was initiated by a unified government. Divided government may have the lowest rate of growth of real federal spending per capita, in part, because it has been an important constraint on American participation in a war." Sobering, and fodder for both proponents and detractors of the divided government voting strategy. It all depends on whether you believe that the decision for war should be made deliberately, or quickly and decisively. I don't want to get overly technical about the econometrics, but this regression is not convincing as it stands... [insert overly technical analysis here - mw] There are many more questions and until there is a much more thorough and complete investigation of this issue, I don't think these results should be taken very seriously." This is a highly technical statisticians debate, and I am not qualified to comment on its merits. Even Niskanen may be appreciative of this Thomas criticism of the "Starve the Beast" hypothesis. As he states in the paper himself:" One implication of this relation is that a tax increase may be the most effective policy to reduce the relative level of federal spending. On this issue, I would be pleased to be proven wrong." However, it is important to point out that this criticism was aimed specifically at the "Starve the Beast" Hypothesis. 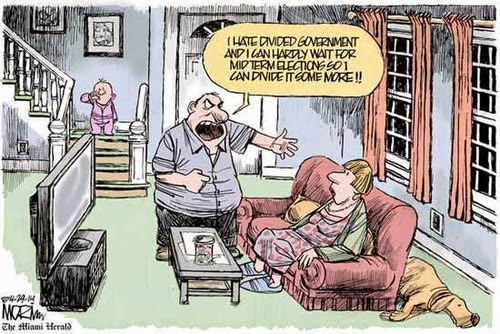 The "Divided Government" hypothesis was unchallenged, and is strengthened by Niskanen's paper.